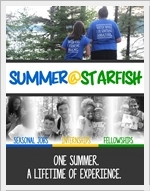 Check out our Staff Guide to Summer @ Starfish! Hear from staff alumni where their Starfish summer led, and learn more about what a Starfish summer can do for you while you're busy at camp changing lives. 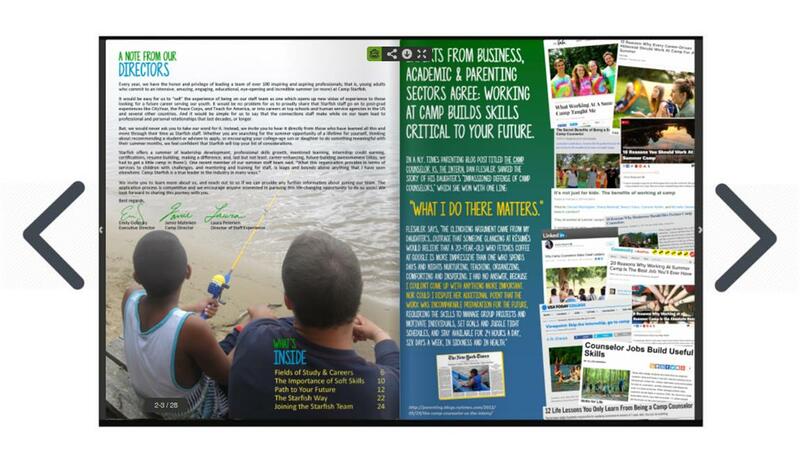 Click the image to open a FlipGorilla interactive flipbook! Starfish staff change lives, every day. The success of every Starfish camper is directly related to the ability of our staff to provide an unparalleled 1:1 experience for each child. We are looking for outstanding people who have the ability and desire to work with children safely, actively, and with enthusiasm. Moreover, we are looking for trustworthy, responsible, dependable, talented, and unique individuals who will really bring something to the camp community. Since our campers each present unique challenges and require extra assistance in diferent areas, staff need to be able to adapt to any situation, communicate clearly and appropriately with children, and be a positive role model. Our staff come from all over the USA and the world! They are generally college students, graduates, school teachers and others who come together to answer this question: "How will I make a difference this summer in the life of a child?" We invite you to explore the program section of the website to learn more about The Starfish Way and the programs we offer. 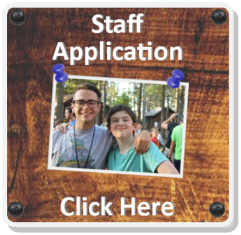 Here in the staff section, you can read up on the importance Starfish places on the camper-counselor bond and the overall experience of being on staff at Starfish. Or, if you already know you're ready to apply for this summer, click here for our online application!